Until the 78th minute, not a whole lot had happened. Nothing that boded well for the chances of the Londoners to best a favored Manchester City in Tuesday’s all-English Champions League quarterfinal anyway. A few decent chances to either team – nothing major, other than a missed penalty by City. Everything appeared to change in the 55th minute, seemingly tipping the series in City’s favor, even though the event in question happened nowhere near either goal. Star Spurs striker Harry Kane drifted over to the sideline and went in hard on City defender Fabian Delph as he hit a long ball. Kane tried to block the ball, missed, and his left ankle wound up underneath Delph’s right foot as he followed through. Delph couldn’t help but land on Kane’s foot. It looked dirty, but it was unavoidable. Kane’s ankle buckled and his foot rolled under. He immediately hobbled off the field. And that was the end of the England striker’s game. Probably a few more games, too. Possibly lots of them. In the last three seasons, Kane has had four separate ankle injuries, costing him a cumulative 23 games. It was a flukey way to go out. And considering that Fernandinho had been playing Kane very physically all game, it was ironic that he wound up more or less injuring himself. All the same, an emboldened City dominated the final half hour of a previously even game as the disheveled Spurs now lacked their attacking reference point. City never got as close as when Sergio Aguero’s penalty was parried by Spurs goalkeeper Hugo Lloris in the 12th minute – after Danny Rose was dubiously punished when Raheem Sterling’s shot caromed off his arm. Yet the balance of power had clearly shifted. This was now City’s tie to lose, with a home game left to play. And the Spurs’ season might slip into free-fall – just as Mauricio Pochettino’s men had finally recovered from an extended slump of four losses in five in the Premier League, ending any hope of a title challenge. But then Christian Eriksen picked out Son Heung-min as the talismanic South Korean snuck through the back line. The forward got his first touch wrong but recovered, turned and found a hole to blast his shot through two defenders and under goalkeeper Ederson. It was all entirely against the run of play, but Spurs held on for the slim home win. Nonetheless, the return leg next Wednesday looks daunting for Spurs. City surely won’t be quite as conservative in its pursuit of two goals. And it feels unlikely that Spurs will have Kane back. And that’s where the difference between these two teams is most clearly illustrated. For City, losing its best and most irreplaceable player wouldn’t be nearly as big a deal as it is for Spurs. In fact, it already happened; and it already wasn’t. Kevin de Bruyne, City’s best player last season, leading his club to the league title, has missed more than four months and 26 games with major injuries this season. Yet City hasn’t missed a beat. Bernardo Silva emerged in the Belgian’s absence and has become one of the league’s top players in his own right. De Bruyne is no longer an automatic starter. And so City, with ample cover in every position to absorb the injuries it’s suffered to several key players this year, remains in contention for the hallowed quadruple. At present, Spurs can’t fathom that kind of depth. The most challenging period of its season came while Kane was out injured and Son was away on national team duty. 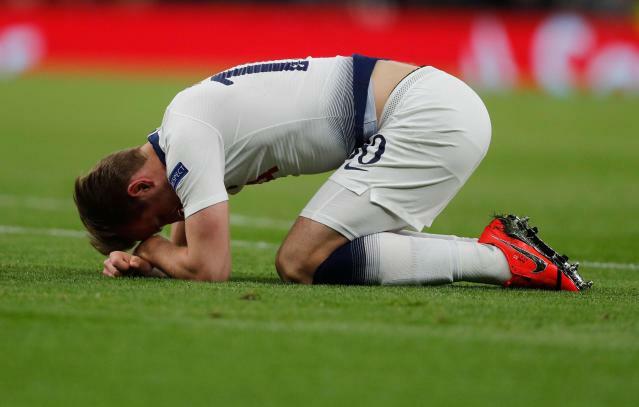 With Kane probably out again, surviving the prospect of the second leg, not to mention clinging onto a Champions League place in the league, becomes fraught. This is why Spurs demolished their iconic White Hart Lane stadium and, at length and with much delay, opened their ballyhooed new cathedral to soccer, Tottenham Hotspur Stadium, with a 2-0 victory over Crystal Palace last Wednesday. The capacity of 62,000 is almost twice that of the Lane and will allow the club to monetize its team as well as England’s top earners. It all boils down to revenue, in the end. And Spurs are playing catch-up. Especially when punishment for breaking UEFA’s Financial Fair Play rules has proved toothless. A fine, no matter how hefty, does little to dissuade clubs, like City, from buying their way to championships with outside investment. That stadium, then, where Kane got injured and Son scored a winner is as much a podium for the Spurs stars as it is a vehicle to make the club less dependent on them. But it isn’t yet. And Spurs, after a night of mixed emotions, face a towering challenge in Manchester, no matter their aggregate lead.